I just love when something delicious is also healthy, don’t you? 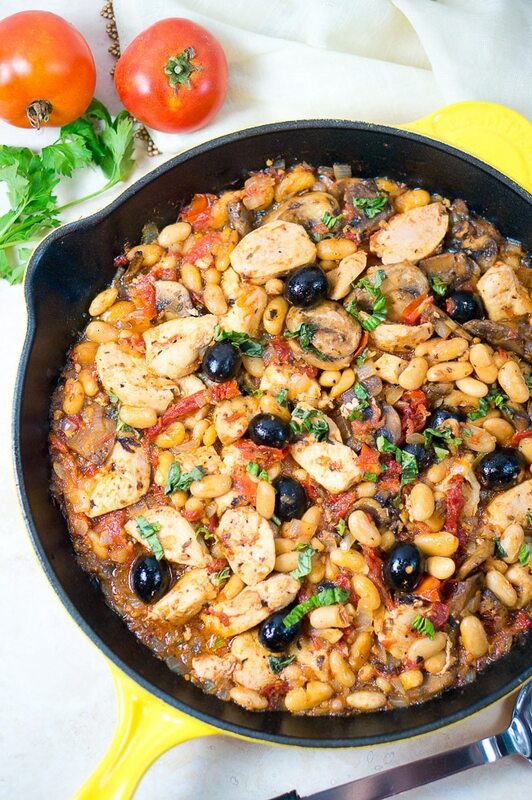 The Cannellini beans are a great addition to this meal and turn this one skillet Tuscan chicken into a super filling quick meal. If you want to make it paleo, skip the Cannellini beans. In a large cast iron skillet heat oil over medium heat, add the cubed chicken pieces and cook for about 8 minutes on both sides, until cooked through. Remove chicken and transfer to a plate. Add another 1 Tbsp olive oil to the skillet and the diced onion. Sauté the onions 3 – 4 minutes until translucent. Add the minced garlic to the onions and sauté together one more minute. Add salt and pepper to taste while cooking. 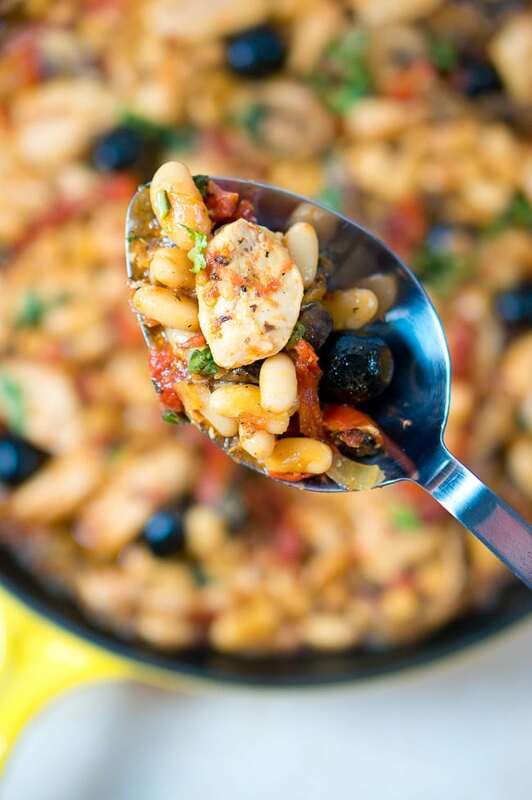 Add 1 Tbsp olive oil to the skillet and toss the diced tomatoes, sun-dried tomatoes, Cannellini beans, and black olives. Season again with salt and freshly ground black pepper. Sprinkle in the oregano, thyme and drizzle the balsamic vinegar and honey. Stir a few minutes. 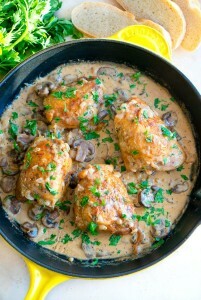 Next, add the cooked chicken and mushrooms to the skillet – stir and cook 1-2 minutes, or until chicken is heated through. Add more salt and pepper if needed. Serve hot, garnished with the fresh basil. This meal was so delicious, I couldn’t get enough of it. 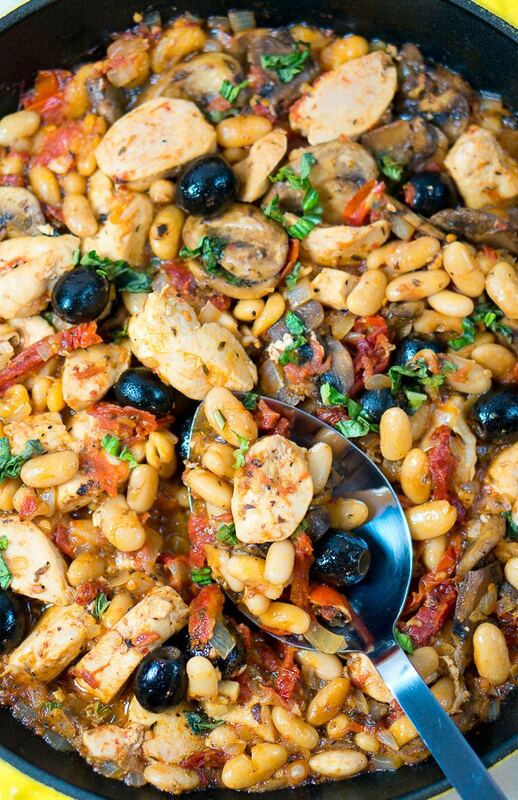 One Skillet Tuscan Chicken with mushrooms, white beans, and sun-dried tomatoes. One Pan, 30 Minutes! One pot dish that's perfect for busy weeknight dinners! In a large skillet heat oil over medium heat, add the cubed chicken pieces and cook for about 8 minutes on both sides, until cooked through. Remove chicken and transfer to a plate. Add 1 Tbsp of olive oil to the skillet and sauté the sliced mushrooms 5 - 7 minutes until the mushrooms are tender and the juices have evaporated. Set aside. Add another 1 Tbsp olive oil to the skillet and the diced onion. Sauté the onions 3 - 4 minutes until translucent. Add the minced garlic to the onions and sauté together one more minute. Add salt and pepper to taste while cooking. What an amazing one-pot meal! Loving everything about this recipe – pinning for later! I know, one pot dishes are the best! 🙂 Easy prep and cleanup! One pot dishes are by far my favorite during the week. Less dishes is always a winner in my book. I love the combination in this dish–the mushrooms and the white beans sound like such a great addition! My eyes are bulging out of my head right now! I am simply in love with the ingredients in this dish and even more in love w how simple it will be to put together! Thank you for sharing! I love one pot meals. This tuscan dish look amazing! Yum! This looks soooo good! I love one pan meals, so easy. Definitely adding this to the dinner roster :). This looks so tasty! I love one skillet/pan meals! This will be a fantastic meal on the nights when you want a quick and delicious meal. This looks very tasty. Yay, one-pot meals! This looks so delicious! I love a good, healthy meal. Thanks for sharing! Oh I love me a one pot meal! This looks so tasty and healthy! I will have to give this one a go! Thanks for sharing! 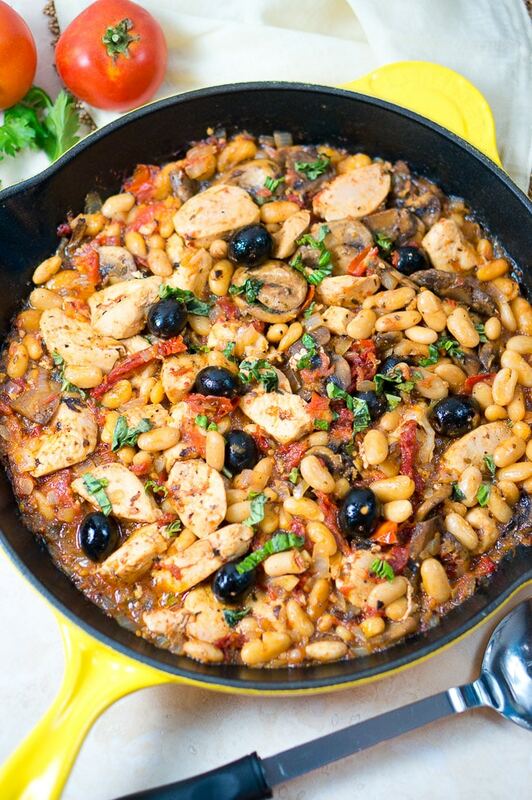 I love one-pot meals and I love meals with olives!! Looks fantastic! Oh, how I LOVE one pot meals! Must try!! 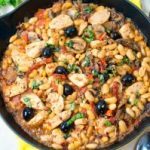 This dish looks like such a perfect weeknight recipe- I love that it only uses one skillet and the addition of olives makes it look so delicious! Hey Neli! Another beautiful dish as usual! 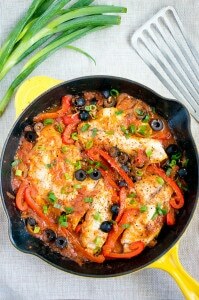 By the way, my husband made your Tilapia Veracruz and it was sooo delicious. Perfectly light, but super tasty! I am now comforted! 🙂 Looks delicious! Thanks for sharing! This looks delicious, and I love how it all comes together in one skillet! Pinned!! Oh, this looks so flavourful and delicious! I like the addition of beans for extra protein! I made this a couple of times. This was so good. I love that it is one pot and clean up is a breeze. The fact that it is really yummy and healthy is a fabulous. 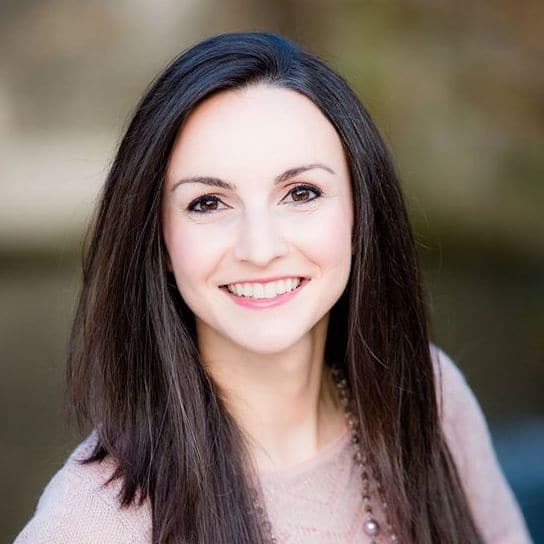 Hi Katrena, glad you liked it! 🙂 Yes, one pot meals are very easy to make and this one is so delicious! 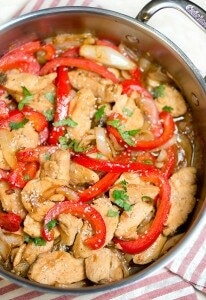 This recipe looks delicious and I love how it’s made in one skillet! It would make a really convenient weeknight meal. I included it in my “Kick Start The New Year #2: 15 Healthy Dinners” post! Made it tonight for dinner! Super easy, filling, and delicious!! Great that it’s healthy too! Tasty, but the recipe text needs some editing. It never mentions adding the mushrooms back in – “at the end, with the chicken” is what I did and it was fine. Similarly, the prep to the chicken breasts should be mentioned – asking for “chicken breasts” in the ingredient list but “cubed chicken pieces” in the directions is not great. This recipe was AWESOME! Definitely adding it to my meal rotation. I’m an olive lover so I added extra olives. I do have to say though, my boyfriend and I aren’t big eaters, and we thought this meal more appropriately serves 3 people. Thanks, Lisa! another olive lover here – you can never have enough olives 🙂 I am glad you liked the recipe! I will have to make it again soon to check the servings sizes. I am sorry you ended up with only 3 servings. thank you again, this meal has become a staple in my house. Although I’ve modified it a bit. I now use a whole can of olives, double the mushrooms, a whole onion, and double the “wet” things. I also put it over linguini or angel hair (it’s awesome, although no longer “one pot” lol). When I do this, it serves 4 till we’re stuffed. I usually make it for the two of us and then eat it as leftovers the next day. This is one of the best recipes! We are trying to eat healthier and don’t want to sacrifice taste. We added a sprinkle of shredded parmesan on top too! My husband and I loved this!!! I will definitely make it again!!! Thank you for such a great recipe!! I have made this several times!! healthy, easy and so good. never any left overs! Thanks, Cindy! I will be featuring your comment on Delicious Meets Healthy’s facebook page. 🙂 So glad to hear you love this recipe! We don’t care if this is a one-pot or a twenty-pot meal — this is some kind of tasty. Mind you, that it is a one-pot meal sure makes it easy. I added a bag of frozen (but heated through) artichoke hearts, which made this extra delish. Great recipe. I have just one comment. I had to print an additional full page to get the nutritional info, which I like to keep with my recipes. It would be nice if that option was included when printing the recipe. Or, did I miss something? Hi Glenna, you didnt miss anything. Unfortunately the recipe card doesn’t have the option to include the nutritional info chart. I wish it did too. I have to additionally include the nutritional info for each recipe. Hope your enjoy the recipe! That looks delicious! I’m all about one pot meals, and love beans and meat combos, so this is perfect. This looks so tasty and I would love to try it, but could you please clarify if the oregano and thyme are fresh or dried? Thank you! Hi Carla, they are dried. 🙂 Happy cooking! Hope you enjoy this recipe! Thanks, Roy! I agree, it’s a perfect comfort meal for rainy days. I love everything about this chicken dish! Totally something I would make! 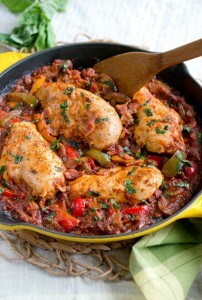 I love the ease of one-pot meals and this looks great, particularly with those lovely olives! Now this is what I call a delicious dinner! I need to go to the store and pick up a few ingredients and then I’m making this bad boy! Yum! I made this last night. Didn’t have mushroom and black olives, and added potatoes and chicken broth. Followed everything else exactly. DELICIOUS. My husband and I couldn’t stop eating it. I will be making variations of this as the weather cools off. YUM! Would black beans be an okay substitute for the white beans? Do you think this could work without the honey? I. In phase one of the South zbeach diet so trying to make is fit in. Using what I had in the kitchen….I substituted a can organic black beans, left out the mushrooms only because I had none and instead of sundried tomatos I used a couple tablespoons of tomato puree I had in the freezer. DELICIOUS! Even my picky hubby loved it! This recipe is a keeper! Thank you! Hi Magdalen, yes, it freezes well. This looks delicious, and I would like to make it. But first….where is the 14 grams of polyunsaturated fat coming from? I am sorry for the confusion. I just reran the recipe and the nutritional information was updated. There is no polyunsaturated fat. 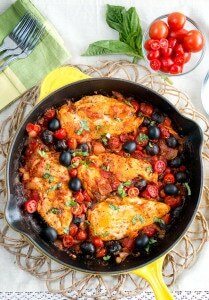 I made your skillet Tuscan chicken. It was delicious. Thanks very much for the recipe. We made this tonight and loved it! We did change a few things based on our vegetarian diet: we added about 1 cup shredded spinach and subbed Quorn for the chicken. We also used 14 oz can of fire roasted diced tomatoes in place of the fresh/sun dried tomatoes. We will make this again!